ST. GEORGE – It’s not every day a suspected scammer from Nigeria calls police, but that’s what happened Thursday when a man called claiming a St. George woman hadn’t sent him any money. “This is the first time we’re had the scammers call in,” St. George Police Officer Lona Trombley said, noting the man called police four different times. The man told police that he had sent a St. George woman a $320 check that was to be sent to a friend of his in West Virginia. “I thought I could trust her,” the man said during one of the calls St. George Police recorded and posted to Facebook Thursday afternoon. The man hung up on the dispatchers when they asked him to share more info about the St. George woman or for a case number from the man’s local police in Nigeria. With multiple calls made, the Police Department started to believe they had a scammer on their hands, Trombley said. Police believe the man may have been recording the calls as a way to intimidate the target of the scam. In such as case, the man would likely use the calls as evidence that he had contacted the authorities and was going to send them after the woman he was attempting to scam. As for the woman the man was calling about, police never did find out who she was, Trombley said, and figured she must have either ignored or simply threw away the check the scammer sent. Parts of the cycle involve potential scammers trying to either gain the target’s trust or threatening them to do what they ask, Trombley said. In some scammer-related incidents in St. George, scammers sent their targets pizza and flowers, she said. Types of scams tend to include promises of winnings, inheritances and investments that will return big as long as you send some money first. Some have involved victims being told they owe money, which is sometimes accompanied with a threat of arrest. 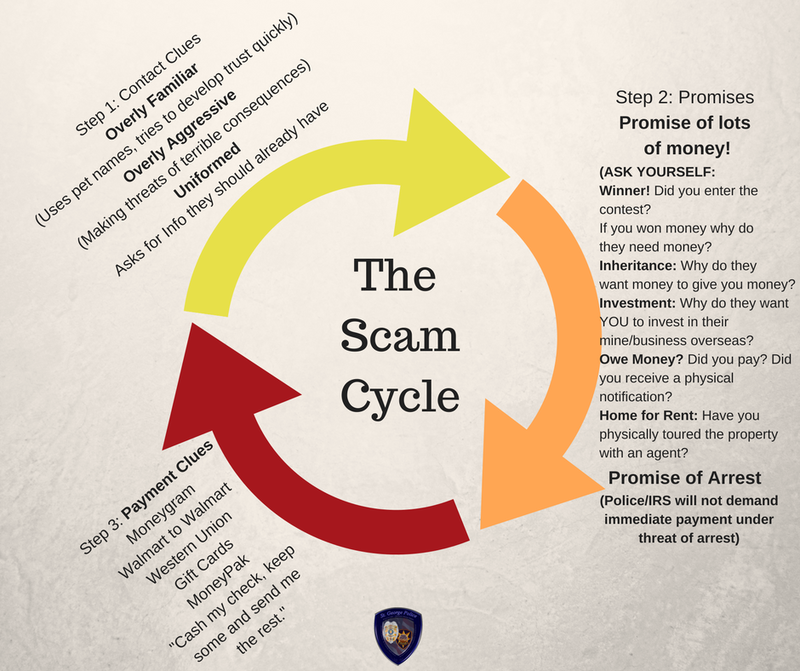 Other aspects of the cycle include the way the scammers want payment sent. This includes services like Western Union, Moneygram and MoneyPak, as well as gift cards and other arrangements. “It causes a lot of heartache for people in our community,” Trombley said. For more information on the type of scams that are out there and how to protect yourself, visit the “Scams and Frauds” pages on USA.gov. Couple scams fast food workers into handing over till money. Can you help police? Yikes . . . wonder if that was me ? ( to minimize their time with other clueless elderly people ) . I sometimes agree to whatever they’re ‘selling’ and then ‘ go to look for my bank cards’ .